An off-kilter, sloping trapezoid, broad and low ceilinged, the white chamber of Les Fuyantes is a place where physical space loops, where gravity upends or bifurcates, and where time halts, stretches and snaps. Our white-suited performers, five of them, seem to be mostly clueless and often scared as every exit portal — whether it's the door in the ceiling, the sidewall or the floor — returns them to the chamber, usually in seconds and sometimes after an impossible traversal of space. Which way, if any way, is out? Flicking from one idea to the next, accompanied by Antoine Villeret's unsettled, glitchy, microscopic music as it clicks and blips like a virally mad computer dialling out to nowhere, Les Fuyantes is a rapid, patchy collection of takes on a central conceit: to warp time and space by disturbing (visual) perception's predictive and interpretive role in linking cause to effect and in building continuity. Through its stage-language, which makes frequent and sometimes very effective use of projection, it also nudges up against ideas of virtual reality and virtual space and their facility in manipulating the ways that we understand what we're seeing. Before the chamber rises and pulls together, there are a couple of short opening scenes which culminate with the performer Boris Gibé, on a flat featureless plane, curling a flexible matrix around himself. This white reticulated grid melds into a projection on the floor, and it's both physical and virtual, a flowing netted sheet ending in a comb of witchily long fingers that shake over Gibé's head — threatening, heavy, bizarre, difficult to control. Later, in the chamber, human shadows cut out and in, detaching from the body that casts them to echo movements from seconds ago. Pushed towards a door, one performer stops but his shadow rushes on — out its owner's body and out a sidedoor (which clicks open ajar, quietly, as the shade slips through). These sorts of scenes play to the piece's minor mood, its undercurrent, which goes after the low, uncanny horror of the inescapable, the unknown, the incomprehensible, and which at least to my mind is more interesting than the major tone — a light, inconsequential style that understands the audience is in on the joke as performers walk up the walls and along the ceiling or play the doubling trick to give the semblance of the same actor emerging again and again from a trapdoor. 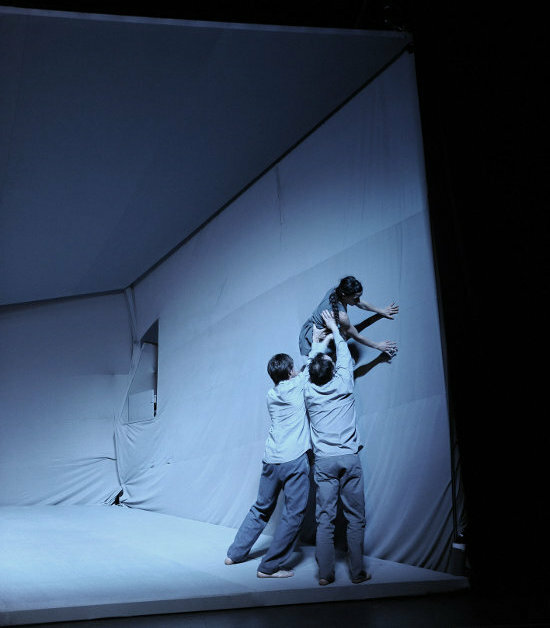 Throughout the performance the darker and more forbidding style, which is strong at the beginning, in fact gradually dissipates as Les Fuyantes allows more inconsistency into the rules of the performance and the trapezoid space: not inconsistency in the sense that sometimes a door leads to a window, sometimes another door, and sometimes won't open at all, which is an unpredictability that just expresses the behaviour of a world or system in a state of malfunction; rather it's the dramaturgy of the relationship between the performers and the structure that surrounds them which is increasingly unclear. What is it to them? What are they to it? Sometimes the performers are characters, sometimes they are the equivalent of stagehands acting out effects (there are also actual stagehands, who are also sort of performers, appearing sometimes wearing hardhats and carrying construction materials). Visually striking as it is, why precede the appearance of the chamber with Gibé's scene with the flexible matrix? Why does one of the characters run out into the audience near the end? Why is he able to? Without clarity of purpose and circumstance, the piece becomes a scenic montage of visual theatre effects, which you will find clever and charming, or not, as a matter of taste and, probably, level of previous exposure. Les Fuyantes reminded me actually of Pierre Rigal's Press, another piece where the performer is contained within a weird, restrictive and sometimes hostile chamber, but where every scene from Press was ratcheted tight by the sense that the space itself was an intelligence or entity — both present and bodiless; never delimited, never revealed — and that the course of the performance was dictated by the inevitability of external forces, in Les Fuyantes there's no such intent. Instead we have an animation scene where the rubbery sides of the chamber are stretched inwards at points, creating the blunt conic feelers of sea anemones as they strain to touch one another; it's played for laughs, and it is sort of funny, but it happens once and is soon forgotten: it's just another idea. Press was also about the reality of space as it defines and limits us rather than about the unreality of a fantastical world, and if anyone were keeping score there would perhaps be more mime performances that gently, pleasantly skew our perception of physical or temporal laws than ones that really investigate the guts of our bodily experience, and it might be part of what distinguishes circus from other branches of physical theatre that circus disrupts our perception of reality from within reality's own rules rather than taking the shortcut of exploiting the kinks and blindspots of perception. It's the difference between You didn't think this was possible but it is, and You didn't think this was possible and it's not, but here's what it might look like. Or: disbelief / suspension of disbelief. So, in the end, Les Fuyantes is a sort of a fantasy, populated by goonish characters who act out the type of high anxiety, expressed through physical awkwardness, that is one of mime's most repetitive fallbacks. We, the audience, are apart from them, and when the trapezoid chamber finally opens up, and the walls come down, and white lines radiate out from a distant centre, there's nothing else for those left on stage to do but to walk up the perspective lines and disappear into the vanishing point. For more on Cie Les Choses de Rien see their interview and profile in the book Panorama contemporain des arts du cirque. The company are also featured on the double-DVD compilation Le Nuancier du Cirque.